If banks won't pull investment from fossil fuels, perhaps it's time to try another route. 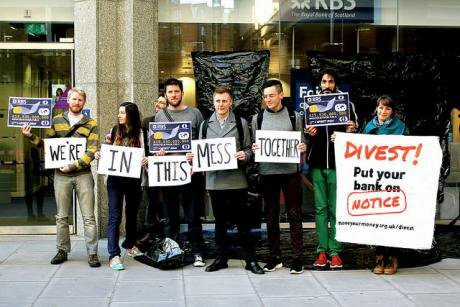 Move Your Money has launched ‘Divest!’ a campaign targeting Britain’s big 5 banks - some of the world’s biggest fossil fuel supporters. £66bn was poured into dirty energy in 2012 alone. Our ask to banks is simple: commit to stopping your support of oil, gas, coal and fracking developments. If you don’t divest, we will leave you. Asking customers to sign a letter to their bank online, we are pressuring banks to wake up to the fact that it’s no longer acceptable to finance climate change. To act takes under a minute. Importantly, we call on them to act within three months. If we don’t see a commitment to a divestment plan, customers have pledged to walk out on their banks by February 2015. Very much inspired by the Market Forces campaign in Australia, which has seen much success in shining a light on the role of banks in coal mining, and following on from 350.org’s institutional divestment campaign, there are five key reasons ‘Divest!’ is a crucial campaign for us all. For too long we have felt removed from our money. This lack of connection, caused by a lack of both transparency and coherent approach to investment, has left us feeling disempowered. The recent Great British Money Survey showed that our confidence about how to handle money is at an all time low, feeling disempowered by financial institutions and a debt based economy we’ve been left in a quandary about how and where to invest. This results in a damaging disconnectedness with money. ‘Divest!’ cuts to the chase and enables people to voice one of their biggest concerns. Not only that, but it highlights that we’re not trapped into a relationship with a bank and that there are other options that better reflect our values. The divestment campaign, started by Bill McKibben and 350.org, has really been game changing for the climate movement. It’s put maths into the debate and, crucially, enabled us to see the financial risk of continued investment in an overvalued asset. A five times overvalued investment to be exact. As a result we’ve seen a whole swathe of local governments, universities, church groups and of course Rockefeller commit to exiting their funds from the energy of the past to focus on a cleaner, more prosperous future. The tide is turning on the fossil fuel industry who, for the first time in history, are struggling to silence the truth with media and lobbying power. ‘Divest!’ cuts through the noise as confident direct action, enabling individuals to feel part of this growing movement. The issue with much of finance, and indeed acting on climate change, has been a perception of complexity. Complexity in understanding both the challenge and the solution. The former borrowing from the future, the latter very much an issue of the present. However, it is in fact very simple. There is no debate, with science and economics in agreement that fossil fuels should go. And those institutions lagging behind, well, you will lose your following. Banks, you will lose your customers. ‘Divest!’ makes it simple to act. 39% of Brits are concerned that their money is going into fossil fuels (from The Great British Money Survey). 36% want their banks to stop supporting fossil fuels. That’s more people than use Facebook everyday. ‘Divest!’ highlights the scale of this demand directly to the banks. Perhaps most importantly, it empowers those pressing for change inside these institutions with evidence that taking a new direction is indeed the correct course. Like it or not, your money is either in the ‘old model’—supporting fossil fuels and causing climate change—or it’s not. You’re one side of the line or the other. You may work tirelessly campaigning, or do your recycling, but where your money is being put to work is, ultimately, what counts. And as we know, change is about the diversion of every single coin. With ‘Divest!’, Move Your Money is providing cleaner banking and alternative finance options, so you can put your money to work in the ‘win win’ economy, where not only will you see a healthy return, but your money will be doing good for the planet too. Money is changing all the time. So, be open minded about what you do with it. In the meantime, as we show demand for change, our hope is we see increasing innovation in clean finance. With fossil free money we will truly have a prosperous society.